PlayStation VR is easier to get up and running than much of its competition, but that doesn't mean it's a simple process. Thankfully you don't have to do it all by yourself. Sony has prepared a three-part tutorial series starring a series of boxes and a charismatic blue man that demonstrates how to properly install and configure your new sensory falsification device. PlayStation VR will be released on October 13. 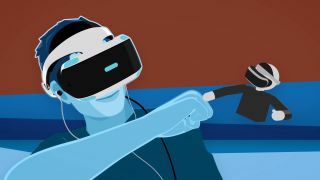 But cool as the headset may look on a polygonal head, you will want some actual games to play on it; check out our reviews for VR Worlds, Until Dawn: Rush of Blood, and Batman: Arkham VR if you're thinking about entering Sony's brave new virtual world.